Fit everything on the shelf in one easy to circulate case! ArtBins can be used to hold all sorts of goodies! Binge Boxes are a great new way to give patrons access to some of their favorite shows/movies, without the patron needing to hunt down all of the movies themselves. These kits usually contain a set or collection of movies that go along with a theme for the box, such as 80’s Favorites or Chick Flicks. Sometimes the theme can be general with a bunch of superhero movies, or even a box based on a popular actor like John Wayne or Reese Witherspoon. Many sets are also being filled with a season or two of a TV show. Most people search for more than one movie when they start getting ready for that long weekend at home, or even a group of friends that just plan to hang out for the night. When someone has trouble thinking of movies to watch together, this could be a great time for people to turn to the library for a solution. Our ArtBins are great ways to package Binge Boxes for your library. With a sliding closure on either side of the handle, the case will stay closed and hold up to many cinematic adventures. Some of our libraries are even including snacks in the boxes, such as popcorn or a snack mix. There are a few different sizes to choose from with the ArtBins, so whether you want to include a stuffed animal with a kid movie or just a bunch of seasons for a favorite show, we have you covered! 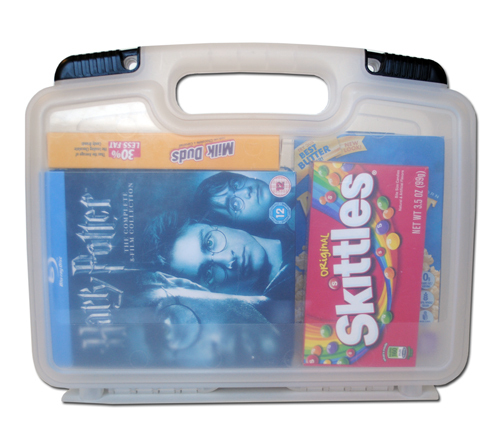 We offer DVD cases that will allow up to 6 DVDs in a case no bigger than a standard single size DVD case, so there are a lot of ways to bundle these movies/shows together. Every library will want to come up with their own perfect Binge Boxes for the patrons they know and care about, though we are always happy to help.